Some books resonate with us long after we’ve finished reading them. 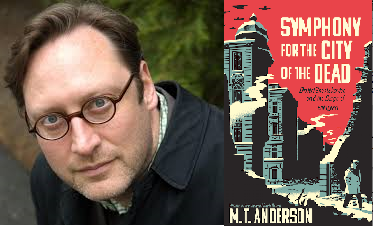 M. T. Anderson’s Symphony for the City of the Dead: Dmitri Shostakovich and the Siege of Leningrad is one such book for me. In 1989 I visited Leningrad and that trip still haunts me. It haunts me because the first thing I remember seeing as we entered the city were antitank barricades, large metal structures that reminded me of the jacks we used to play with as kids. I will also never forget all the WWII vets who sat on public benches wearing their uniforms filled with medals and missing limbs and the respect they were shown by passers-by. Lastly, our visit to the Piskaryov Memorial Cemetery, where over one half a million citizens and soldiers are buried in mass graves, was a site I will never forget. And I, as a history major in college and a high school history teacher, wondered why I had never learned about this event and of its significance. M. T. Anderson’s newest book, Symphony for the City of the Dead: Dmitri Shostakovich and the Siege of Leningrad, is his tribute to the citizens of Leningrad who endured the brutal 872-day Nazi siege, the longest and most costly in history. More importantly, Anderson shows how the Russian passion for music maintained their spirits, if not their lives, during those long dark days. Among the Russian composers of the day, Shostakovich was beloved and internationally known, so he was a sort of beacon of hope to his fellow Russians and his Leningrad Symphony #7 symbolized their strength in the face of the Nazis who had mistakenly assumed that Russia would be easy to conquer. This was not an easy book to read (or listen to, in my case.) He spares no detail in describing Stalin’s pre-war purges or the horrors of the seige. However, I loved it. Anderson’s book reads like compelling fiction, showing a very human Shostakovich right in the middle of the historical events which played around him. Anderson is also honest by helping the reader see that although he became known as a hero, he often had to make difficult and controversial choices to protect his young family and himself. I think this is an important book for Americans to read because we don’t learn enough in school about either Shostakovitch or the Russian’s role in WWII or how the siege still affects that country and its politics. Ultimately, this book is a testament to the power of music and its ability to stir the human spirit which enabled the Russians to rise above the struggle and envision an ultimate victory. Although this book is shelved in our adult nonfiction collection, I would highly recommend this to older teens who love music and also those who want to understand how history influences modern politics. Also, those teens who have read about fictional dystopian societies might learn something about real human nature. Powerful stuff! November 10, 2015 in Read - Watch - Listen.